The thought that someone could be watching or listening to you can be frightening. But, what do you do if you find out that your fears are real? Investing in surveillance equipment detection is only half of the answer, the rest lays in what you choose to do next. Finding surveillance equipment in your home or office is going to raise a number of questions for you; who is watching you and why, being the main two. The third should be what do you do next? Once bug detection has taken place, you have three main options. Firstly, you can take the information to the police and leave everything in their capable hands. This may be the most sensible thing to do, particularly if you feel your safety is at risk or that the surveillance is the prelude to a potential crime being committed. Alternatively, you can have all of the equipment removed, improve your security systems, and move on. This is the option many people who have been bugged by an ex-partner prefer to take. The third option, which can also involve some counter surveillance, is often the choice of companies trying to protect their business secrets. This approach involves leaving the bugs in place and feeding the other party false information. This is only likely to work if they are unaware that you have found the bugs in the first place. But, it could be an effective way of finding out who is responsible for spying on you and understanding why. However, this approach should never be considered if you are anyone you know is put at risk through it. Of course, none of these options can even be discussed until you know for sure that you have been spied on and that all the bugs have been found. For this, you need surveillance equipment detection of the highest quality. And that is exactly what you get from Advanced Sweeping. 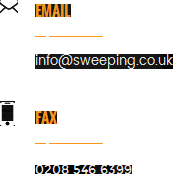 Visit our website, http://sweeping.co.uk/, to learn more.